Sorry I haven't gotten back to you. 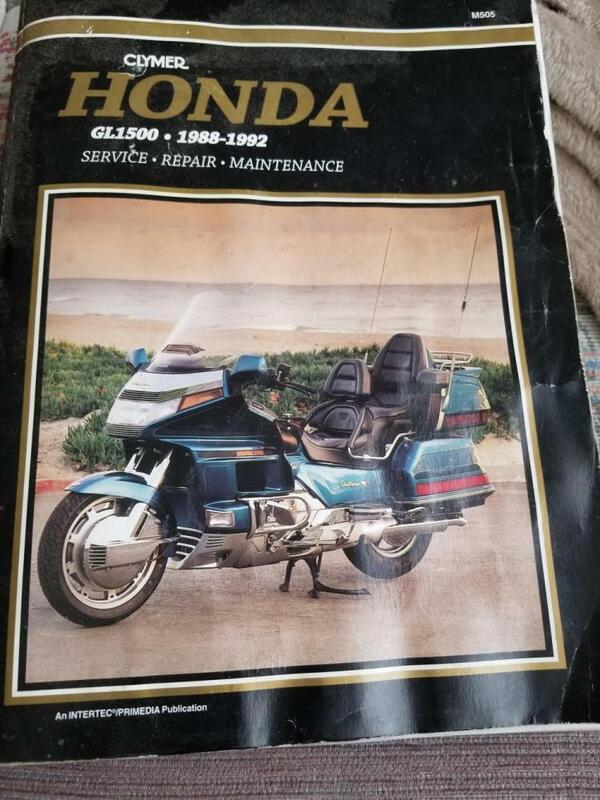 Yes I am interested in buying the GL1500 manual. Does it cover 1997 Goldwings? And how shall I purchase this from you? Money Order? PayPal? Ebay? Send me a PM (private message) and I'll PM you the information you might need...or give me a ring...I can PM you my mobile number. How much will shipping cost? There are differences regarding what is controlled by the 30-amp and 55-amp fuses between the 1988 - 1992 manual and the 1993 - 2000 manuals. Also differences regarding what is controlled by the Tail Main Relay # 3. Most other items would be about the same. If I had a 1997, I would want a manual with the correct electrical schematics.....but that's just me............!! My coolant temp sensor (under the right intake manifold) for my GL1500 came in today. Does anyone have instructions on how to replace the sensor? I'm hoping this might be the cause of poor fuel mileage. I'm still going to remove the carbs (to replace the float needles) and the coils (to check for cracks and to perform an ohms test). As I recall, you need to remove the Right Fan Housing, then just reach in to unscrew it for replacing... probably want to drain the coolant first. It's been a while, and I don't remember all the details, but we had to remove the tupperware from the front of the bike, the sides of the bike, and the top of the bike. You need to remove the cooling fan on the right side - it can be a chore to get it out, and back in. With the fan out of the way you can reach in and grab the sensor - we didn't have to drain the coolant, but a bit will leak out when you remove the sensor. Once you get it all back together you want to start the engine, WITHOUT TOUCHING THE THROTTLE. Let it idle until the fans come on and go off - this resets the engine computer. If you haven't drained the coolant, then some will have dropped onto the engine while you were swapping the sensor - this will generate copious amounts of steam while the engine is running; don't worry - it'll clear up! Are you referencing the "Carburetor Coolant Thermal Valve" page 5-14 OR "Coolant Temperature Sensor" page 5-17.....??? Look at the attached pages....!! Fans don't need to be removed to do carb work.....!! Plus the left fan is more difficult to remove/replace than the right fan. DBohrer, you are right about the fans, left is much harder to get out and in. There is a bracket in the back , upper right side that if you take that bolt out it gives a little slack to get the fan back in. Thats sitting and facing the left fan. Having both fan's out makes it a little better for me. Those's pages from the manually should help him change that sensor. I replaced my jet's in the carb's with what was in a kit the main jets were 48's the bike would not accelerate and would bog down if I rolled the throttle on to fast. I put the stock 58 jet's back in and replaced the diaphragms that was over 2 years ago and no problems. I get 35 to 39 mpg depends on where I'm going. I do think different years had different size main jets because of smog law's. I have found if I try to fix to many things at once I don't have much luck. That's what I was trying to say, get the carb's right and vacuum lines back where they go and the bike should run. If not look at the spark. Works for me but I just guessing.